Kundan jewellery, which was first originated in Rajasthan, is one of the most popular choices of Indian brides for their wedding jewelery. 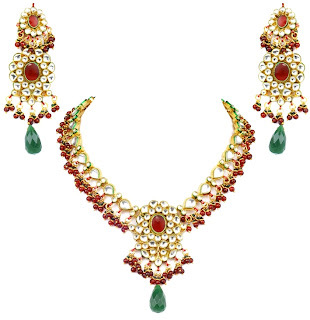 The splendour of kundan work lies in the accurate setting of gemstones into kundan; the overall final look of the ornament greatly depends on how the setting was done by a skilled craftsman. The beauty of this jewellery is that it can be made multihued to match with your outfit. Let’s face it, though yellow gold is ever eternal in India, sometimes its drabness can take away from the most exclusively done bridal outfit. Rubies, jades, amethysts, garnet, etc. are all widely used to create a kundan bridal set. If you have a lavish budget, it can also be made with fabulous uncut diamonds. Though many people are of the opinion that kundan or vilandi do not have much resale value when compared to gold or diamond jewellery, it hasn’t really stopped brides and families from investing in them. In fact, jadau sets made decades ago are passed on from generation to generation as the most favoured hand-me-down ancestral heirloom.